Top, at the Fairmont Hotel in San Francisco during the California Newspaper Publishers Association 119th Annual Convention, managers and community reporters respond to the news: (back, l-r) Richard Hoegh (Frazier Park), Founder Nedra Hawley Cooper, Publisher Gary Meyer, Doug Peters (Pinon Pines), (front, l-r) Juanda Lee DeShazer (Lake of the Woods), Karen Bailey (Pine Mountain), Editor Patric Hedlund and Office Manager Pam Sturdevant. Bottom left, the awards announced at the CNPA convention. Bottom right, a keynote speaker at lunch. 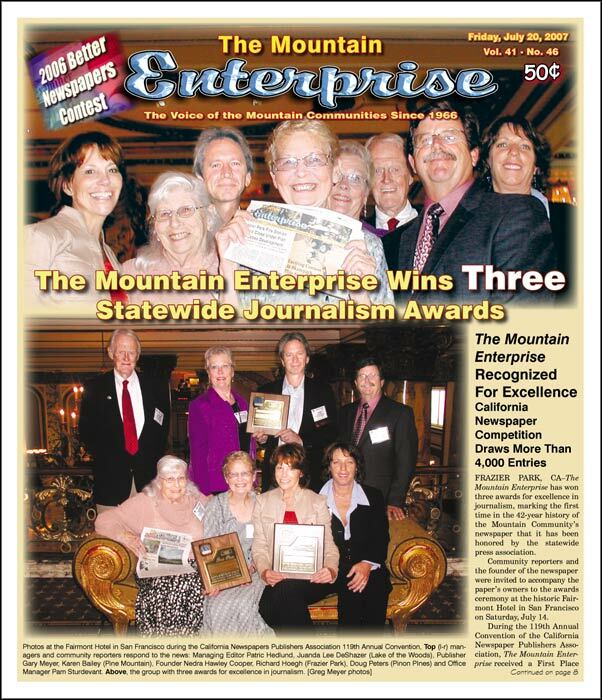 FRAZIER PARK, CA—The Mountain Enterprise has won three awards for excellence in journalism, marking the first time in the 42-year history of the Mountain Community’s newspaper that it has been honored by the statewide press association. Community reporters and the founder of the newspaper were invited to accompany the paper’s owners to the awards ceremony at the historic Fairmont Hotel in San Francisco on Saturday, July 14. 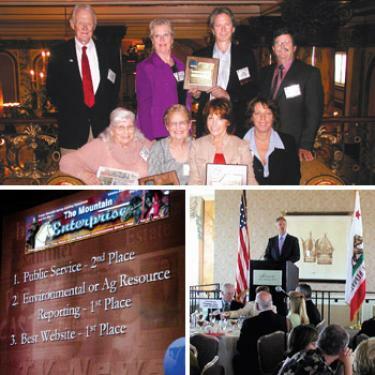 During the 119th Annual Convention of the California Newspaper Publishers Association, The Mountain Enterprise received a First Place award for its series of reports on the Frazier Park Estates housing development project, First Place for its website and Second Place for its series on paramedic and ambulance issues. The paper closely reported detailed findings in a series of hearings hosted by the Mountain Communities Town Council and added original reporting about the developer’s proposal. When community reporter Doug Peters analyzed the housing project’s six volume Draft Environmental Impact Report (DEIR) for data regarding water studies, Editor Patric Hedlund and Publisher Gary Meyer worked with him to explain clearly how ground water measurement data had been scattered throughout the report in a confusing manner. When Peters assembled the data and presented it in a graph published in the paper, readers learned that the water levels in the proposed development area (near Frazier Mountain High School in Lebec) had fallen significantly over a period of 11 years. Following a Kern County public presentation of the DEIR, the The Mountain Enterprise published the Planning Department’s subtle verbal assertion that, according to the development plan, Frazier Park’s Fire Station 57 would be closed and moved three miles away to the housing development site. After significant and well-informed public input by letter and email during the 45-day comment period, Kern County’s Planning Department withdrew the DEIR and required the developer to perform a complete rewrite. The Mountain Enterprise received a First Place award for "Best Website" within the new site’s first few months of operation. The site, www.Mountain Enterprise.com went online in December 2006. It is a feature-filled yet simple-to-use site, designed for high functionality and user convenience. Back issues of the paper can be searched using a full range of Google-like search tools. It also contains significant additional material in the Community FYI areas. This year, The Mountain Enterprise’s full 42 years of history are being prepared for inclusion in the archive. In addition to the two First Place awards, The Mountain Enterprise’s coverage of ongoing community efforts to bring full-time Advanced Life Support (ALS) paramedic services to the outlying areas of the Mountain Communities received a Second Place award for Public Service reporting. After Pine Mountain resident Harold Bailey died of a heart attack in 2005 while waiting more than an hour for an ambulance to arrive, The Mountain Enterprise reported the groundswell of community action that persisted to demand improvements by private company Hall Ambulance Service and in standards demanded by Kern County’s Emergency Medical Services Department. On May 29, 2007 the Kern County Grand Jury recommended that Kern County Fire Department establish paramedic services in Pine Mountain and that "Kern County Fire Department and private ambulance companies resolve their differences" regarding public safety in medical emergencies. Kern County Fire Chief Dennis Thompson has announced that a third firefighter will be on duty at Station 58 in Pine Mountain during all shifts by August 1 and that his goal is to have firefighters licensed as ALS paramedics on the mountain within the next two years. A fourth series by The Mountain Enterprise received the CNPA Certificate of Achievement. The Mountain Enterprise provided in-depth reports about actions of the El Tejon Unified School District (ETUSD) board of trustees, then-superintendent John Wight and Frazier Mountain High School’s principal to offer a Philosophy of Intelligent Design course in early 2006. While ETUSD’s superintendent provided soundbites to national TV news networks from the campus, The Mountain Enterprise published interviews with the teacher offering the course and the lead plaintiff in a lawsuit filed with eleven other parents requesting that the course be stopped. During the final days of the class, ETUSD Superintendent John Wight called the Kern County Sheriff’s Department to have publisher Gary Meyer and editor Patric Hedlund of The Mountain Enterprise arrested for reporting on the high school campus-a right and responsibility of the press on behalf of the public, protected by state and federal law. The paper dedicated a forum in its pages for the community’s ongoing dialogue about Intelligent Design for more than a month. The lawsuit was settled and the superintendent resigned three months later, thirty minutes after being shown a videotape of himself allegedly taking gasoline for personal use in six trips within four hours from school district gas pumps, appearing to pump gasoline into a system of containers assembled in the rear seat area of his car. When the board president refused to discuss the existence of the tape and the reason for the superintendent’s sudden departure, a public records request submitted by The Mountain Enterprise secured release of copies of the videotape. The newspaper also published a carefully documented history of serious problems in a previous district where the former superintendent had served. See "El Tejon Unified School District" under "Community FYI" at www.MountainEnterprise.com for those stories. More than 4,000 entries were received by the statewide newspaper association from over 400 contest participants throughout the state. Newspapers compete with their peers in categories set by size and frequency of circulation. Management of The Mountain Enterprise was assumed by Patric Hedlund and Gary Meyer in September of 2004. This is part of the July 20, 2007 online edition of The Mountain Enterprise.